*Excited to announce official launch of AVENTURERA Kickstarter campaign! 33 days left being 33 years old, 33 days to raise $33,000* Can you help? Thank You! Merci Beaucoup! Gracias! San Francisco bay based eclectic independent music producer Razteria is reaching out to fans to help fund the two interwoven projects, the production and marketing of new album Aventurera and development of Truffula Oak recording studio. In addition to Razteria’s discography & album release concert tickets, backers can choose from tailored recording and music production sessions at her own studio, and a line of merchandise which is ethical, environmentally friendly and healing. From organic cotton Fair-Trade T-shirts, to a line of essential oil based body care products by Berkeley based SoL Essence Oils, there is something for everyone. Ten percent of proceeds are being donated to a non-governmental organization Helping Refugees in Jordan (HRJ). 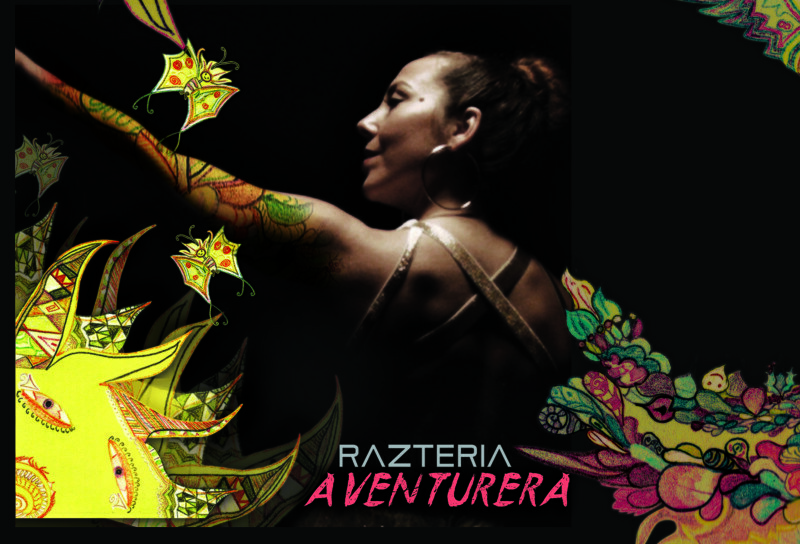 RAZTERIA, a fusion of No Doubt, Bomba Estereo and Marisa Monte, who breaks musical boundaries and sings in English, Spanish, French and Portuguese, has been preparing the release of her 5th independently produced album Aventurera which drops March 18th, 2016 online and instore. Just debuting on the CMJ New World chart February 2016, the album shows great promise. The Aventurera album consists of 10 tracks (+ 2 bonus tracks), crossing between English, Spanish and French. It is to be released to honor spring (March 18, 2016), and symbolizes rebirth. This album is groundbreaking in its richness, representing the synergy of collaborations with talented independent SF Bay artists and beyond. 3) LIFE, the oldest track on the record, recorded with Fyah Squad Band, was written 11 years ago, and has finally melted into its first published form, fusing haunting vocals with a tribal beat and 80’s rock. This song’s theme is ageless, calling us to never give up and take on life in all of its forms. 4) TAKE MY HAND, a funk rock ballad about wishing that the other could see inside your mind, bypassing the misunderstandings that come as a result of the imperfections of communicating through language or the misinterpretation of one’s actions. It features two Bay area based lyricists, Seneca Schachter and Chatterbox . 5) LITTLE SISTER, is a lively reggae-pop tune emanating the importance of nurturing relationships, mentorship and love. This is Razteria’s a personal message to her younger sisters and nieces. 6) ONCE AGAIN, is an odd cross of funk and rock with a rap by Rahman Jamaal and drums by Jayme Arredondo. Razteria’s favorite on the album representing her wish to live to see, hear and feel loved ones all over the world, once again. 7) ZONE, a jam trippy track extracted from a Halloween night jam session together with pianist and songwriter Carolyn Smith. 8) THANKFUL is a simple spiritual song of praise, in the same thematic vein of Gracias a la Vida by revolutionary folk songwriter Violeta Parra. 9) WORLD is a positively melancholic track which emanates tragic beauty, juxtaposition of the contrasting struggles of so many in this world, with the beauty of this world. It calls for us to recognize and share our lives in solidarity. 12) ONCE AGAIN (bonus vocal mix) is a powerful yet ethereal mix featuring a Razteria’s signature harmonies and Rahman Jamaal’s rap. The harmonies are reminiscent of Queen. Aventurera was 90% recorded & produced at Razteria’s Truffula Oak Studio, which she is raising funds to finish. The studio has been progressively built over the past 3 years with sound engineer Josh Petersen and the Big Tadoo Puppet Crew. It is currently up and running with a minimum recording gear to do quality recordings. Nestled in an old growth of live oak trees up hidden in El Sobrante Hills, the name “Truffula” symbolizes a more general goal of sustainability with the imagery of the Truffula tree, the central focus in Dr. Seuss’s 1971 environmentally themed children’s book “The Lorax”. A powerful tale which is more relevant now than ever before, the dire need to conserve the earth’s precious and finite natural resources. The studio is currently 100% solar powered and Razteria is working towards having a food forest and full grey water system. Check out http://www.theloraxproject.net for ideas on how to spread the message of the Lorax. Razteria has made it priority to offer ethical and environmentally friendly gifts to backers in appreciation of their donations. She worked closely with Berkeley based Sol Essence Oils to develop essential oil healing products which match the messages in the songs “Life” (Cheer blend), “Change” (Passion blend), “Take my hand” (Serenity blend) and “the World” (Wild Orange oil).